Before President Trump trashes the Iran nuclear deal, he might consider: If he could negotiate an identical deal with Kim Jong Un, it would astonish the world and win him the Nobel Peace Prize. For Iran has no nuclear bomb or ICBM and has never tested either. It has never enriched uranium to bomb grade. It has shipped 98 percent of its uranium out of the country. It has cameras inside and inspectors crawling all over its nuclear facilities. And North Korea? It has atom bombs and has tested an H-bomb. It has intermediate range-ballistic missiles that can hit Guam and an ICBM that, fully operational, could hit the West Coast. It has shorter-range missiles that could put nukes on South Korea and Japan. Hard to believe Kim Jong Un will surrender these weapons, his ticket of admission to the table of great powers. Yet the White House position is that the Iran nuclear deal should be scrapped, and no deal with Kim Jong Un signed that does not result in the "denuclearization" of the peninsula. If denuclearization means Kim gives up all his nukes and strategic missiles, ceases testing, and allows inspectors into all his nuclear facilities, we may be waiting a long time. Trump decides on the Iran deal by May 12. And we will likely know what Kim is prepared to do, and not prepared to do, equally soon. France's President Emmanuel Macron is in D.C. to persuade Trump not to walk away from the Iran deal and to keep U.S. troops in Syria. Chancellor Angela Merkel will be arriving at week's end with a similar message. Will North Korea agree to surrender its nuclear arsenal, or is it back to confrontation and possible war? Will we stick with the nuclear deal with Iran, or walk away, issue new demands on Tehran, and prepare for a military clash if rebuffed? Do we pull U.S. troops out of Syria as Trump promised, or keep U.S. troops there to resist the reconquest of his country by Bashar Assad and his Russian, Iranian, Hezbollah and Shiite allies? Beyond, the larger question looms: How long can we keep this up? How long can this country, with its shrinking share of global GDP, sustain its expanding commitments to confront and fight all over the world? U.S. planes and ships now bump up against Russians in the Baltic and Black seas. We are sending Javelin anti-tank missiles to Kiev, while NATO allies implore us to bring Ukraine and Georgia into the alliance. This would mean a U.S. guarantee to fight an alienated, angered and nuclear-armed Russia in Crimea and the Caucasus. Sixteen years after 9/11 and the invasion of Afghanistan, we are still there, assisting Afghan troops against a Taliban we thought we had defeated. We are now fighting what is left of ISIS in Syria alongside our Kurd allies, who tug us toward conflict with Turkey. U.S. forces and advisers are in Niger, Djibouti, Somalia. We are aiding the Saudis in their air war and naval blockade of Yemen. The last Korean War, which cost 33,000 U.S. lives, began in the June before this writer entered 7th grade. 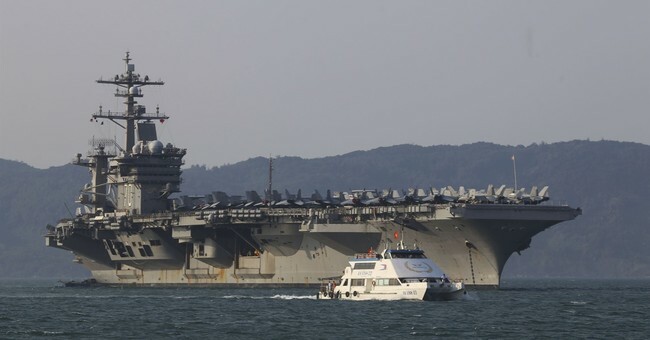 Why is the defense of a powerful South Korea, with an economy 40 times that of the North, still a U.S. responsibility? We are committed, by 60-year-old treaties, to defend Japan, the Philippines, Australia, New Zealand. Voices are being heard to have us renew the war guarantee to Taiwan that Jimmy Carter canceled in 1979. National security elites are pushing for new naval and military ties to Vietnam and India, to challenge Beijing in the South China Sea, Indian Ocean and Arabian Sea. How long can we sustain a worldwide empire of dependencies? How many wars of this century -- Afghanistan, Iraq, Syria, Libya, Yemen -- turned out to have been worth the blood shed and the treasure lost? And what have all the "color-coded revolutions" we have instigated to advance "democracy" done for America? In a New York Times essay, "Adapting to American Decline," Christopher Preble writes: "America's share of global wealth is shrinking. By some estimates, the United States accounted for roughly 50 percent of global output at the end of World War II. ... It has fallen to 15.1 percent today." Preble continues: "Admitting that the United States is incapable of effectively adjudicating every territorial dispute or of thwarting every security threat in every part of the world is hardly tantamount to surrender. It is rather a wise admission of the limits of American power." It is imperative, wrote Walter Lippmann, that U.S. commitments be brought into balance with U.S. power. This "forgotten principle ... must be recovered and returned to the first place in American thought." That was 1943, at the height of a war that found us unprepared. We are hugely overextended today. And conservatives have no higher duty than to seek to bring U.S. war guarantees into conformity with U.S. vital interests and U.S. power.